Have you heard a lot about West Nile lately? It may sound scary, but the mosquitoes carrying the virus are close to home! West Nile is a virus that is spread primarily through the bite of an infected mosquito. Mosquitoes become infected when they feed on a person already infected with the virus. West Nile has recently been in local news, as Fairfax County Health Department has identified the first reported human case of West Nile Virus disease this summer. So far, in Maryland, there were five reported cases of West Nile last year, according to the Centers for Disease Control and Prevention. In Virginia, there were 13, and in the District, there were four. In recent years, when one human case occurs in an area, other cases often follow in the same part of the county. Wear loose, light-colored clothing long-sleeved shirts and long pants when possible. Sleep indoors in rooms with air conditioning or window/door screens to keep mosquitoes outside or use a bed net while camping. Empty standing water from containers such as buckets, bowls, flowerpots and vases. If you cannot easily empty water from a container, treat the water with a larvicide that will help control mosquitoes in the water. Read and follow label instructions when using a larvicide. If mosquitoes are flying and biting, use an insecticide to control the mosquitoes in your yard. Read and follow label instructions when using an insecticide. 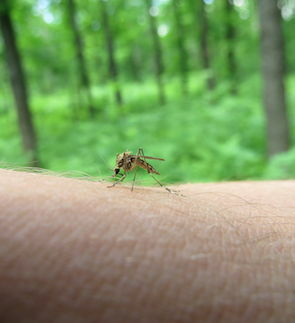 West Nile virus can affect a person’s nervous system. Symptoms can include muscle aches, headache and fever. Most people make a full recovery over weeks or months, officials said, but severe cases can lead to meningitis, paralysis and even death, according to experts. Less than 1 percent of those people contracting the virus will develop severe symptoms. The most vulnerable to the virus are people age 50 and older and those who have weakened immune systems. Anyone who thinks they may be infected should see a doctor immediately. Mosquitoes can be very pesky, and now mosquitoes in our area can cause West Nile Virus. If you have a mosquito problem and citronella candles just aren’t cutting it, contact the pest management professionals at Alexandria Pest Services to schedule an on-site evaluation and free estimate for pest control services. Call us today at 703-923-0925!